HomeNews and discussion of 3D design, technology, and Information. Partner website for HDRSource and LunarStudio. About the AuthorAbout the author of LunarLog, Charles Leo. About LunarLogAbout the LunarLog website and its content articles. ContactContact page for LunarLog 3D technology, news, and renderings. SitemapSitemap of 3D Design, Renderings, Technology, and Information. 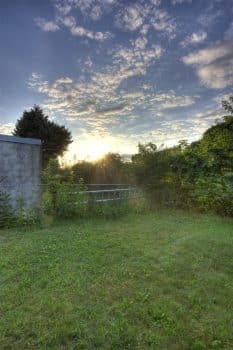 An HDR Photo From my Backyard. I haven’t written here much because the last two months have been absolutely crazy. If I’m not busy working on projects or promoting the LunarStudio business, I’ve either been fielding inquiries, responding to job applicants, or working on three separate blogs/websites. While I read economic reports of the “slowdown”, work on my end has actually picked up. Typically the summer months have been slower for me and it get’s busier into late fall through the spring. If this is any indicator of how things might be, then LunarStudio is looking at a very busy year ahead of us. I hope that this is the case for everyone in my field as many people have taken a big hit. My head has been in a tailspin. I’ve probably averaged 4 hours worth of sleep each night for the past three weeks in particular – trying to get projects out the door and keep my clients happy. I’m not complaining by any means – just stating how it has been. When work comes in, it tends to come in all at once. And that has been the tendency for the past 5+ years. I can’t really explain why it happens that way, but it really does. And seeing that a period of time could be extremely busy then the following weeks might come to a crawl, I’m very reluctant to say no to anyone. During the past month, I’ve worked on a dairy processing infographic, a graph animation, this blog, another blog, a coffee kiosk, and a synagogue. Then toss some research on top of all of that. It’s been crazy to say the least. Add to this is my on going work with my other business/website, HDRSource. It involves High Dynamic Range photography and is one of the oldest HDR-related websites on the Internet. I originally got into taking HDR photos for 3d lighting and development when the field of HDR was still relatively unknown. I had a store that sold libraries and it did modest business. But as the years went on, camera equipment improved and so did methodology, so I took a back seat to HDRSource, laid off promoting the website, and focused all of my resources on LunarStudio. Recently I’ve gotten back into producing 360 degree High Dynamic Range photos for 3d. I started ordering camera equipment over the course of the summer and studying up on the latest and greatest techniques. I figured that this could help weather the slower periods of 3d work – plus it’s just nice to occasionally get out of the office and out on the streets while the weather remains good. It’s definitely a nice change of pace. I’ll try to make an announcement when the site goes officially “live” again. It’s already up there, but I’m still working on the new libraries and mechanics of the digital download/digital asset shopping cart. Anyways, please stay-tuned for the HDRSource announcement. Even if you’re not looking to purchase HDRs, I think one could still appreciate the photographic aspects to these images. Happy New Year From LunarStudio! LunarStudio’s Architectural Rendering is up on Pinterest! LunarStudio Has a New Office!